Mozilla Firefox web browser has reached the 53 stable release makes Firefox faster and more stable with a separate process for graphics compositing (the Quantum Compositor). Compact themes and tabs save screen real estate, and the redesigned permissions notification improves usability. Windows XP and Vista are no longer supported. XP and Vista users running Firefox 52 will continue to receive security updates on Firefox ESR 52. 32-bit Mac OS X is no longer supported. 32-bit Mac OS X users can switch to Firefox ESR 52 to continue receiving security updates. 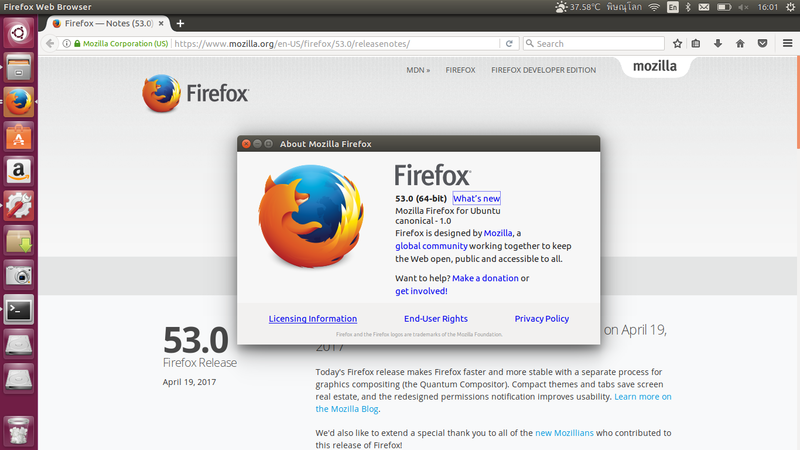 To check your Firefox version on Ubuntu, go to Help > About Firefox.